Designed by renowned French bike maker, Lazareth, the Wazuma V8M promises pure driving pleasure. There are bikes that take you from one place to the other. And there are adorable beasts that promise pure driving pleasure and make you relish an opportunity to handle one. The Wazuma V8M surely falls in the latter category. The trike is as appealing as they come but the appeal goes beyond the looks. The high-power engine and other amazing features ensure the Wazuma V8M’s functionality matches its looks. You can rest assured every ride would be a memorable one. Designed by the renowned French bike maker, Lazareth, the Wazuma embodies the Lazareth design par excellence – futuristic features and W geometry, combined with outstanding performance and character. The concept, inspired by the first model of Wazuma V12 is crossed with the indomitable LM847 and takes the visual signature of the latter. 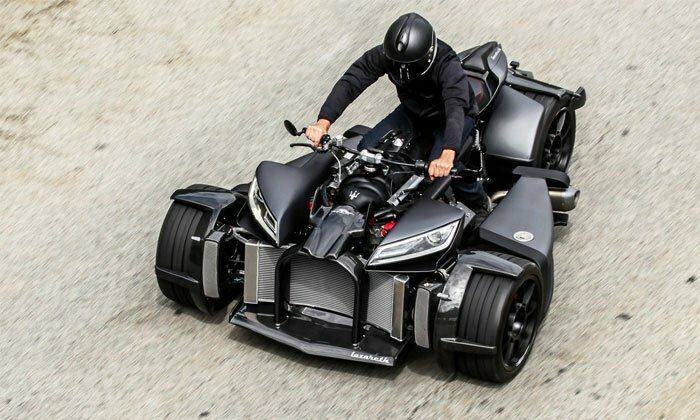 Perhaps the greatest strength of this super-charged trike is its engine. The Wazuma V8M boasts a 4.7L, 460hp Italian V8 engine and 520 Nm of torque. The engine is significantly more powerful than you would find in most bikes and that is one of the reasons why the Wazuma V8M isn’t just any bike. Power transmission to the ground is provided by 315mm Michelin tires (285 for the front) mounted on 18″ OZ Racing wheels. There are 12 metallic color options. In addition, there are special colors such as matt gray metallic, to offer you the best customization possibilities. The metallic paint job complements the beastly look and further confers the ‘Batman’ feeling on the rider. The bodywork is nothing short of breathtaking and the metal parts are as durable as they look. Accessories such as mirrors and turn signals were provided by Rizoma. The company says that each body element is made and adjusted by hand, composite and carbon fiber in their workshops. Lazareth mentions that the Wazuma V8M is approved in accordance with French regulations. It will be produced in limited series of ten numbered copies. If you can afford this cool beast, there is no reason why you shouldn’t go for it. It literally screams your name, begging to take you on a ride. The actual feeling of riding is orgasmic and the pleasure is even greater if you’re a bike aficionado. You can book your Wazuma V8M by contacting the makers on their official website.